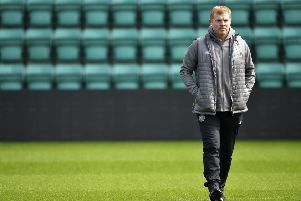 Erik Sviatchenko was initially speaking only in jest when, during his signing negotiations with Celtic last month, he suggested they might also consider recruiting his partner. But in a move which simply adds to Danish defender Sviatchenko’s less than conventional background, he has now duly been joined at the club by Anne Rudmose. Seven months pregnant with the couple’s first child, Rudmose will not be able to make her debut for Celtic’s women’s team until the summer. Football, though, is very much a serious business for the 25-year-old winger who already enjoys no shortage of bragging rights when it comes to comparing her career with Sviatchenko. Rudmose played for Denmark in the 2008 Women’s under-17 World Cup finals in New Zealand, where they lost out to eventual winners North Korea in the quarter-finals, and also helped her country finish third in the under-17 European Championships in Switzerland the same year. Rudmose, who latterly played for ASA Aarhus in the top flight of Danish women’s football, met Sviatchenko when she was best friends with his twin sister. Their shared passion for football has been a constant and key factor in their relationship. “We talk a lot about football when we are at home together,” she said. “It is part of our lives. Sometimes I give him advice – I think I am a better player than Erik! We analyse the matches together. I am very honest and I tell him if he has had a bad game. “I was 12 when I started playing football and it took off quickly from there. When I was 15, I got into the Danish national set-up. I played for the youths, the under-17s, under-19s and then the under-23s. As the couple posed for media photographs at Celtic’s training centre yesterday, there was a predictable response from Sviatchenko’s team-mates. “They were standing up and banging on the windows when they saw us,” he laughed. “But that’s fine. This is who we are. “Anne has been playing football all her life and it’s a good thing for her because it helps her socialise. We’ve come from Denmark to a new country, so it’s nice that she also feels at home. Celtic have helped massively with organising everything. At first we only spoke jokingly about Anne joining as a player but then it became quite serious. Sviatchenko is also settling happily on the pitch following a torrid start to his Celtic career. The 24-year-old was pitched into an earlier than planned debut as a substitute following Efe Ambrose’s dismissal in the League Cup semi-final defeat by Ross County, then experienced another loss when making his first start against Aberdeen at Pittodrie. But three successive clean sheets and victories since then have provided Sviatchenko with a clear sense of better times ahead. “I was rushed into things but that has worked quite nicely from my point of view,” he said. “It was a bit rough to start with but I was looking to see how both myself and the team bounced back. “Now we have won three games in a row, we’ve started scoring goals again and also keeping clean sheets, which is every defender’s main target. So I think we’re getting better and better every day. Sviatchenko hopes to make a happier return to Hampden, scene of his debut loss, when Denmark play Scotland there in a friendly at the end of next month. Capped four times for his country, he is anxious to secure a place in the first squad to be named by their new coach Age Hareide. - Erik Sviatchenko and Anne Rudmose were speaking at the launch of IT and telecoms company Exsel Group’s shirt sponsorship deal with Celtic’s women’s team.